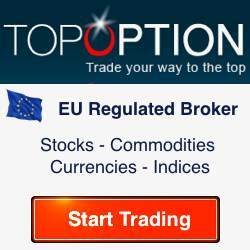 Below you'll find our binary options brokers ranking. This binary option broker comparison is the result of a thorough review of each binary option broker in the ranking list, in which we looked at questions like 'which binary options brokers are regulated', 'which broker gives the best bonus', 'what kind of features does the platform of a particular broker offer', 'how many tradable assets does a broker offer', etc. Though this ranking knows a first and last place, chosing a binary options broker also depends on specific preferences you may have as a trader. The aim of this binary options broker review page is therefore to give you more insight into some of the most popular binary options brokers and to help you chose the one that is best for you. Topoption offers 180+ different assets in stocks, currencies, commodities and indices. Free e-book on binary options. Regulated by CySec. Anyoption was one of the first binary option brokers. Offers 120+ different assets in stocks, currencies, commodities and indices. Regulated by CySec. Stockpair offers 150+ assets, predominantly stocks but also some currencies and indices and a few commodities. Has own trading platform. Regulated by CySec. Traderush offers 100+ different assets in stocks, currencies, commodities and indices. The first binary option broker to offer 60 second options. Regulated by CySec. Banc de Binary offers 90+ different assets in stocks, currencies, indices and commodities. Regulated by CySec. Cedarfinance offers 60+ different assets in stocks, currencies, indices and commodities. Free e-book about binary options for new traders. Not regulated. Bonuses offered by binary options brokers are normally instant, meaning you can trade with them right away, although of course you still have to trade a certain volume to be able to withdraw the bonus. Some brokers offer relatively large bonuses, others provide something extra in educational material or excel in the number of tradeable assets they offer. At the binary options brokers review page of each broker we look at the number of tradable assets offered, what kind of bonus is offered and what the requirements are for withdrawing the bonus, ease of use of the trading platform, the quality of the customer service and how easy it can be reached, the conditions for depositing and withdrawals, whether or not a broker is regulated and other things. The binary broker reviews are meant to give you a quick overview of the pros and cons of a particular broker, also when compared to other binary brokers. As said, 'the' best binary options broker doesn't really exist, because different traders have different needs and what is very important for one binary trader might not be that big of a deal to another. What we tried to do was give you a comparison based on criteria most traders find important when looking for a binary options broker, things like regulation, customer service, the number of tradable assets and things like that. And when doing this, a clear ranking did surface. One of the reasons for instance why Topoption came out on top as the best binary options broker, was that it was regulated from the get-go and is owned by the same company that also owns Markets.com, a successful forexbroker. Trading software and customer support also jumped out at Topoption. In the coming months we will review more binary option brokers and add them to this binary brokers ranking list.